Plate with Union Jack design encased in opal white glass. Clear glass with fused sandblasted decoration in red and blue, cased in opal white glass. Free blown and spun. 10% lead glass. The flag decoration was made and kiln-fused before being incorporated into blown form. 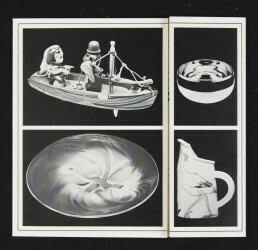 Plate, Dillon Clarke, 1977, Crafts Council Collection: G12. The piece was one of the first double colour sandblast incorporated pieces. It was very complicated to precisely register the cross of the flag.